Yellowcard are back with their long-awaited new album. Fact. A reunion? False. After a two and a half year break, the Florida five-piece have returned to the scene with a record that is going to take fans by surprise. New and old. The band couldn't have picked a more perfect time to release this new record. It's 2011, and pop-punk is in high demand. With the reunion of bands like Blink-182, The Starting Line and The Get Up Kids, and the ever increasing success of new blood, Four Year Strong, Title Fight et al; pop-punk has never been stronger. 'When Your Through Thinking, Say Yes' starts off where the band's last record, 'Paper Walls,' finished. But, the thing about this release is, the band's previous efforts echo throughout. A mix of the band's signature blend of pop-punk/pop-rock, it flows together perfectly. Stand out tracks are 'The Sound Of You And Me', 'With You Around' and 'Sing For Me'; which has potential to rival the band's smash hit, 'Only One'. 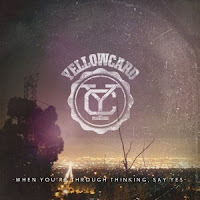 'When Your Through Thinking, Say Yes' is released on March 21st (UK) / 22nd (US) through Hopeless Records. Pre-order 'When Your Through Thinking, Say Yes' through Banquet Records. Yellowcard on MySpace, Facebook and Twitter.